The daughter of a baker, Marie Guyard was born in Tours, France, on October 28 and married a silk manufacturer named Claude Martin when she was seventeen; the couple had one son. Claude died two years later and Marie became a bookkeeper for her brother-in-law. In 1629, she joined the Ursulines at Tours, taking the name Marie of the Incarnation. In 1639, she was sent to Canada where she laid the cornerstone of the first Ursuline convent in Quebec in 1641; she rebuilt it when it was destroyed by fire in 1650. She compiled dictionaries in Algonquin and Iroquois and taught the Indians the rest of her life until her death in Quebec on April 30. She experienced mystical visions and suffered periods of spiritual aridity about which whe wrote and her LETTERS give a valuable account of life in Quebec in 1639-71. 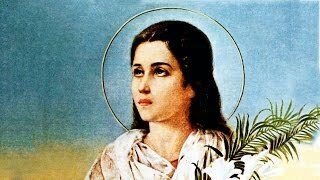 Also known as Marie of the Ursulines, she was beatified in 1980 by Pope John Paul II.